Sullivan County Manuscript Collection 0079. Inter-Mountain Newsletter Collection, 1929-1947 [not inclusive]. MSS 0079, Archives and History Division, Sullivan County Department of Archives and Tourism, Blountville, Tennessee. This collection is comprised of company newsletters dated 1929-1947 (not inclusive) published by Inter-Mountain Telephone Company. The initial slogan for Inter-Mountain Telephone Company was, "For the Purpose of Creating a Closer Fellowship Among Our Employees". The initial name for the newsletter was the "Inter-Mountain Developer" and was later changed to "Inter-Mountain News". The collection is highly significant for historical and genealogical researchers in that the issues contain numerous photographs and genealogically-related tidbits on people in Sullivan County and surrounding areas of East Tennessee and Southwest Virginia. 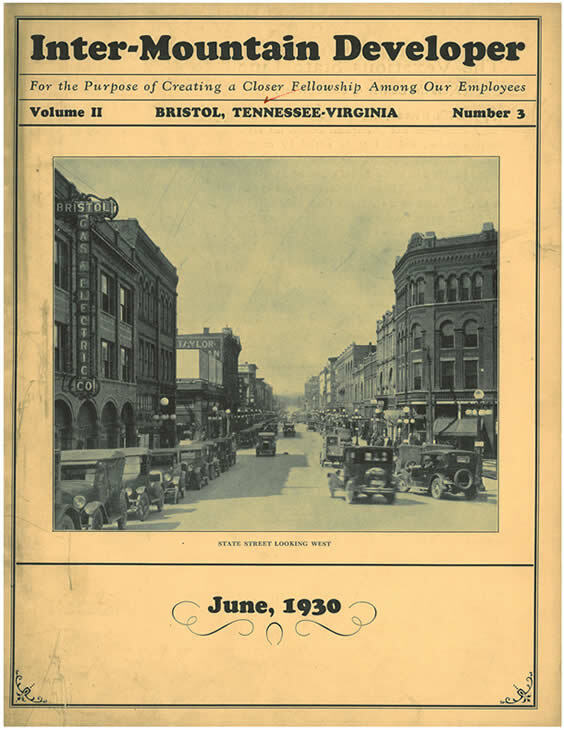 The collection includes numerous military photographs, photographs of historically significant places, historical articles, birth and death notices, and wedding announcements of Bristol, Kingsport, Johnson City, Jonesborough, Abingdon, Galax, Roanoke, and other cities. 1. Inter-Mountain Newsletter Collection, 1929-1947 [not inclusive].